This final round tournament game saw Black achieve complete positional dominance by the early middlegame. At the time, I thought I had played reasonably well against my higher-rated opponent until that point, but more objective analysis shows how I simply did not understand what was required in the position after playing some standard opening moves. I also had not learned much at all from my earlier round loss in the English where I mishandled the central pawn structure and failed to play e4 at a critical moment (see the recent Amateur Hour post for more on this). Overall, it was bad to be White and good to be Black in this tournament (for me at least), since Black was the victor in all five of my games; I had Black twice. Perhaps a contributing factor to this performance was a certain overconfidence in my experience with the English Opening and an unconscious assumption that the rest of the game should easily take care of itself. As I was paired up by a significant margin each time I had White, this did not work out so well. In this game, Black's central threats could have been nullified by White on move 14 with the prophylactic e4 push, but White fails to comprehend his weaknesses (including the hanging Nc3) and ends up with his pieces offside and ineffective by move 18. Black's subsequent careful, relentless crushing of White is instructive and shows how this kind of positional dominance can nullify any hope of an opponent saving themselves with tactics, as none exist. This was the last tournament game I played before starting this blog and getting serious about chess improvement. Although for the next annotated game I plan to look at a specific game from earlier in my chess career, after that we will get to see more contemporary games and what lessons they may hold for my ongoing development as a player. This Mastery Concept post, as others in the series will do, highlights an idea that was new (to me) as part of my chess studies since this blog was created. Exposure to these types of "mastery" ideas - ones that are more sophisticated than simply "I go here, my opponent goes there" - I believe are essential to the improvement process. Humans are not particularly good brute-force calculators, so starting your thinking process with calculation is unlikely to provide you with the tools needed to find the strongest candidate moves. At the master level, the process is in fact usually reversed: an idea is first recognized on the board, then calculation follows to determine if the associated candidate moves work. This is the primary benefit of pattern recognition. One repeated observation of amateur play is that amateurs fall into the trap of assuming that each move must be significant in itself - make a threat, defend a weakness, etc. Master play is significantly deeper in recognizing that a move may be used in order to prepare a much greater threat, set up a combination, and so on. One of the more subtler concepts that I've run across, and it is perhaps more valuable to recognize because of its subtlety, is clearing squares for pieces. The piece that is moving is therefore not the significant actor in the chess drama, it is the piece that will replace it on the square. This may be an obvious concept to many, but for those of us who too easily overlook ideas or valuable candidate moves, the insight can help our thinking and give us an extra edge. It can also be a combinative idea or a positional one, so it has broad applications. Chess being a practical game, here are some illustrations of how this mastery concept can work in practice. Chesstempo also has an illustration of a piece clearance sacrifice as part of its reference on tactical motifs. This game was highlighted on GM Bhat's There and Back Again blog and was included in Daniel Naroditsky's Mastering Positional Chess (New in Chess, 2010). The next move in the viewer (19...b5) dramatically paves the way for ..Nb6 and gets Black out of a serious jam. The link above has more of GM Bhat's analysis and commentary. This is a classic modern game featuring a pawn sacrifice in what Hans Kmoch in Pawn Power in Chess termed a "sweeper-sealer-twist" - the pawn is moved (sacrificed in this case) in order to replace the pawn with a piece on the square. Here 12. e5! is the move that the rest of the game revolves around, as the e4 square is pivotal for White. A classic historical game that shows how effective clearing a square for another piece can be. This fourth-round tournament game was a ratings mismatch but nevertheless enjoyable and interesting to play - of course when you are the winner, that's easier to say. What I thought was a poor idea by White in the opening (an early d5 advance) is not necessarily bad, according to Houdini and the database, as White could have gained some development and spatial advantages in return for his gambited pawn. Instead, faced with the prospect of being down a pawn with no compensation, my opponent sacrificed a piece for what turned out to be only some brief pressure. This game showed some positive signs of improvement in my thinking at the board. Overall, it was a blunder-free game on my part, which reflected the care taken to anticipate possible White threats. The defensive moves are coherent and sound, also reflecting a more sophisticated understanding of using dynamic factors, for example on move 21 when Black's e5 pawn is tactically defended. The breakthrough tactic on move 23 may be obvious to many players, but for me it was the product of a less strictly materialistic way of thinking, which has been one of my historical handicaps. (Although it's worth noting that I focused on recovering material rather than delivering an immediate mate as a follow-up.) Analysis also showed an interesting pawn sacrifice on move 19 which would have lead to an earlier breakthrough. When annotating games it's necessary to concentrate on your deficiencies in order to avoid them in the future, but at the same time it's also important to recognize examples of good play in order to repeat them in the future. This was a positive game in that respect, despite the mismatch. In this latest "return to chess" tournament series, following the second-round Annotated Game #97 was the third-round Annotated Game #2. It was one of the first that I selected for the new (to me) practice of analyzing my own games, as it was a memorable example of what is today's Amateur Hour theme: making move choices primarily based on emotional factors. By definition this is irrational and while it won't always lead to disaster at the board, it will certainly hurt the quality of your game and can be a major roadblock to improvement. While we may usually think of emotional moves as those made suddenly due to fear, anger, or impatience, the phenomenon is actually broader than that. There are moves you make because of emotion, but there are also moves you avoid because of emotional considerations. One of the main reasons I lost Annotated Game #2, an English Opening, was because as White I refused to consider playing the move e4 at a critical moment. I felt this would be an "un-English" move and in my own, somewhat warped view of my playing style, I believed that I was a flank opening player rather than a classical opening one. Somehow e4 "felt wrong" not based on an objective evaluation of the board position, but on my own feelings about ever playing the move. I was an example of the other side of the emotional coin, never going for an attack unless specifically provoked into counterattacking and usually playing passive, "positional" chess. Lack of tactical and attacking skills certainly played a role, but I think fear of risking an attack and having it blow up in your face was also a large part of it. At some point, though, I started accumulating greater exposure both to specific attacking ideas and also to the key notion that as a player, you must do what the position "tells you" to do - if it says attack, do it! In that respect, review of well-annotated master-level games is an excellent way of making your chess more objective, as it allows you to see what works and what doesn't in specific situations. This is not to say that your feelings on a particular day can't legitimately influence your decision-making process. Some days we are more energetic than others, or simply feel like playing a certain opening over another. This is both normal and practical. We also face tournament situations where we may have the desire to either conserve our energies for later rounds, or conversely to make a strong, aggressive push for a prize. There's a difference between these kinds of high-level considerations, however, and the silly, unobjective feelings that can derail our thinking process and lose us games. An article on the Foreign Policy site (containing the above image of Deep Blue vs. Kasparov) provides a tongue-in-cheek - in other words, half-joking and half-serious - look at the struggle for chess dominance over the centuries and how that relates to global power-shifting. Some of the site's commenters, it seems, have taken the link between chess dominance and world dominance far too seriously and literally, but I would say the article offers an amusing (and rare) combination of accurate chess history with mainstream news/analysis. This second-round tournament game featured a Slav Defense that could be considered dubious from multiple angles. The first one is White's 4. Bg5, which is almost never played for a reason. It gives Black immediate equality by making the bishop a target, weakening the dark squares on the queenside (particularly the e1-h6 diagonal and b2) and if as occurs in the game the bishop is exchanged off, then Black sits quite well with the bishop pair and the doubled f-pawn which covers e5 and g5. The second dubious feature is the middlegame struggle, which gets a lot of "?!" and some "?" annotations. This might be somewhat unfair, given the relative complexity of the positions and how understandable it is that in several cases the obvious moves are made rather than the best ones. However, it is also a wake-up call for us Class players that just because a move is obvious does not mean it should be played automatically. The attack and defense dynamics are, despite the flaws, interesting to see, starting with White's 16th move. The game becomes quite tactical and the evaluation of the winning side swings back and forth several times. Some key ideas for future use are highlighted in the analysis, in particular how Black could have improved with 16...Nf8, using solid defense, and then with 18...c5! in order to answer White's flank attack with a break in the center. In the end, White is too materialistic, being unwilling to sacrifice material in order to break through on the kingside, so Black is able to turn the tables on his attacker. 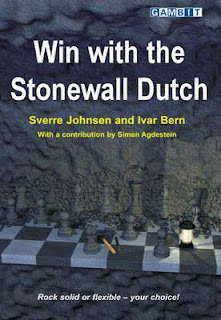 I originally began Win with the Stonewall Dutch (Sverre Johnsen/Ivar Bern/Simen Agdestein, Gambit, 2009) in 2011, getting through Chapter 6 (and the Stonewall Hero exercise) before putting it down for about a year. I was fortunate enough to have the chance to play in a series of tournaments for the first time in a while, so decided to focus on preparing for that and concentrating more on middlegame studies, rather than on learning the Stonewall and trying to incorporate it into my play. As I'm now in the middle of another extended break from tournament play, I decided to tackle the book again (from the beginning) and completed it earlier this week. Although of course it is not perfect, the book is certainly one of the best chess books that I have read - in any category - and naturally is also among the top rank of my opening books. The above-linked review provides a good overview of its contents, while here I would like to focus on its utility for both opening study and overall training purposes. The bottom line for me was that it was good for my chess, not just as an opening reference. This reflects the idea that learning a new opening should be for the goal of overall improvement, not just providing you with a new way to get to move 10 and leaving you with no idea what to do in the middlegame. The fact that the book was the work of three practitioners at different skill levels - Ivar Bern an OTB IM and Correspondence GM, Simen Agdestein a GM and former Norwegian champion, and Sverre Johnsen a strong Expert-level writer - for me was a strength rather than a weakness. They had personal experience with the opening for a number of years and brought that experiential knowledge, along with a willingness to research a wide range of alternative methods of play, to their analysis and presentation of the different opening lines. Despite the book's title, this is not a one-sided tract for lovers of the Modern Stonewall, but a thorough and balanced treatment. Although the authors are not completely objective, in the sense that they want Black to be able to do as best as possible, this does not appear to have affected their judgment of chessboard realities. They also have a certain sense of humor, which I think helps to put evaluations of different possibilities in perspective, rather than taking everything deathly seriously. This also feeds into a certain tolerance for unclear evaluations, which are part of the reality of chess. The "real-world" approach of the book, which relies on a large number of annotated games to inform its theoretical sections at the end of each chapter, is designed to highlight practice before theory. The main annotated games are also where a number of important concepts are discussed. Most important for improvement and training purposes is the fact that the book challenges the reader, both explicitly and implicitly. There are 12 exercises which require the reader to think for themselves, not just look over material, and include a variety of content such as middlegame combinations. Some exercises are also deliberately designed to have a long-term effect on your chess training practices and studies, including analyzing a variety of move choices in a theoretically critical line as well as the aforementioned "Stonewall Hero" database and analysis exercise. Another challenging and valuable aspect of the book is that it is not a repertoire book where only one recommended line is treated for Black. Where the authors do have a preferred repertoire choice in some cases, they explain their reasoning and normally provide at least a description of the alternatives. The book of course is not infinitely expandable, so judgment had to be used in terms of what was most important to include. There is in fact a huge amount of material and the authors do not shy away from addressing things like move-order and transpositional issues, which adds to the complexity of the work but I think is both welcome and essential. I went through the book using a full-size wooden chessboard and played through the vast majority of the book's lines, variations and sample games. (The one exception to this was the chapter on playing the Dutch versus openings other than 1. d4, which I have no intention of doing.) After having completed the book, I'm now going back over the material using my repertoire database and selecting my preferred lines, in the process doing additional research and analysis. The book contains far too much material to be absorbed fully in one or even several pass-throughs. Reading and playing it through once, however, gave me a great sense of the Stonewall in all phases of the game. I expect return to the book repeatedly for study and reference purposes. The Classical Stonewall (with development of ...Be7 instead of ...Bd6) is not treated at all. This means that the book cannot be considered a complete guide to the Stonewall. This did not bother me too much, as I preferred that the authors focus more fully on one option or the other, rather than bouncing back and forth, which is what occurred in the otherwise excellent Starting Out: The Dutch Defence. The main Classical Stonewall plan of developing the light-squared bishop to the kingside is given secondary treatment here to the modern queenside development options after ...b6, although in some lines the old plan is still necessary and is covered well. Secondary variations in the main annotated games are usually quoted from other games, with light or no annotations, although with evaluations given in each line. Coverage of the anti-Dutch lines, including the gambits, is more restricted in terms of Black repertoire choices, so the reader will need to do additional research if they want more choices.